"Our family reunion is coming up—I’ll definitely be practicing my bean-bag throwing so I can dunk my dad on the first try." 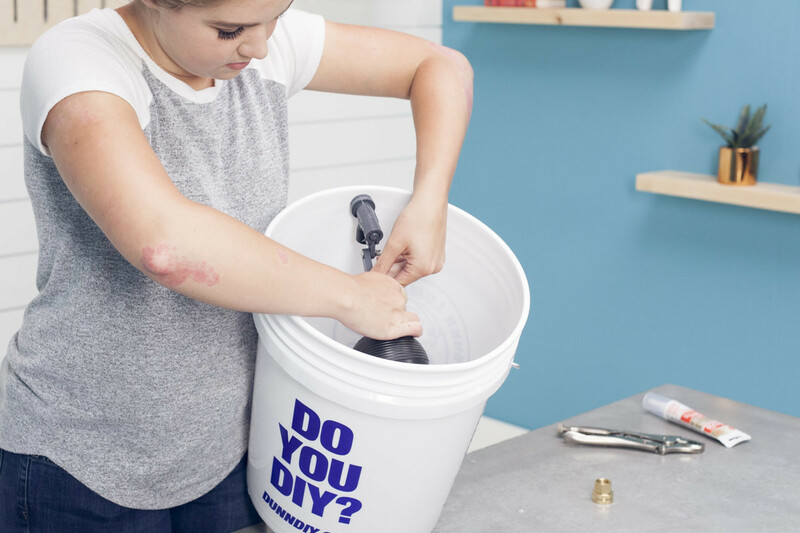 When I was searching for some fun new summertime DIY projects, I came across a company that sells dunk tank kits. I figured that if a dunk tank was being sold as a kit you can put together, I could surely DIY it. 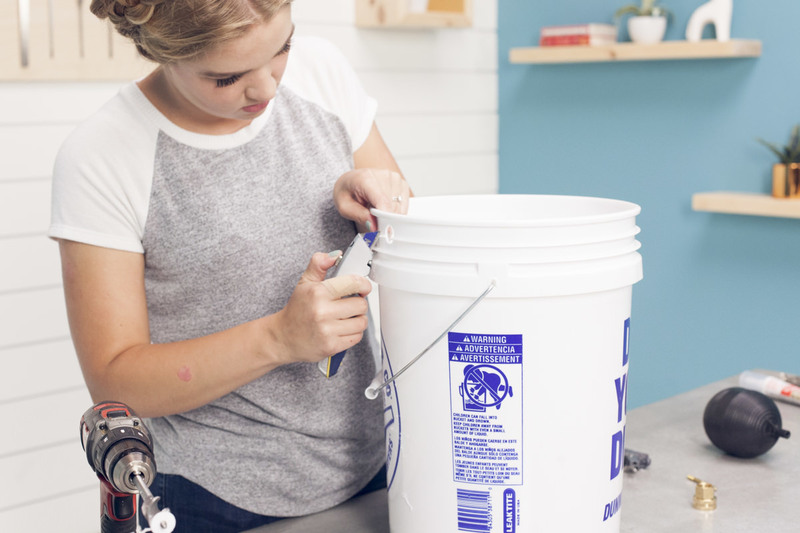 Spoiler alert: I could and I did, but it required some serious online searching and inspiration, especially because building this style of DIY dunk tank involves a basic understanding of plumbing. (Don’t worry—it’s not too difficult to pick up.) My version was based heavily on this one, and I’m really excited by how it turned out. 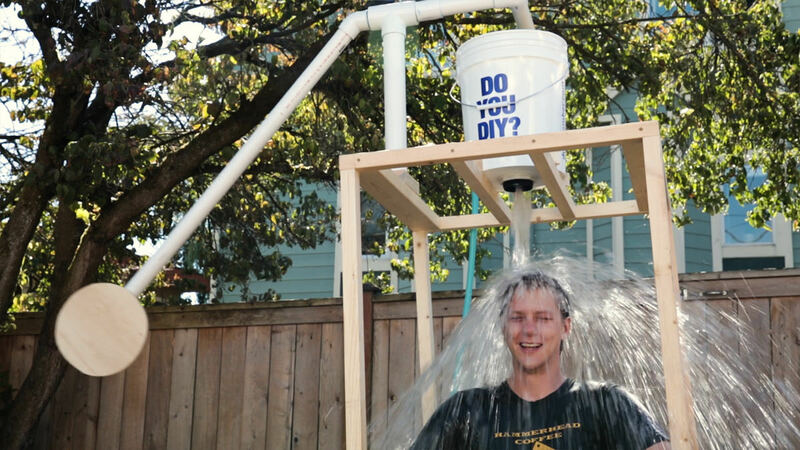 This project is totally worth the time and the effort, and it’s not only a great way to cool down on a hot, sunny day (Seattle’s been extra warm this summer), but it’s a great equalizer, too. Where else can an employee get away with dumping water on their boss or a kid get away with dumping water on their parents? I’m planning on making this dunk tank part of the Dunn family reunion (watch out, dad), but it would work just as well for summer camp, company off-sites, or any ol' day in your backyard. I tested it out on myself (turns out I was the only volunteer I could get), and it felt great. 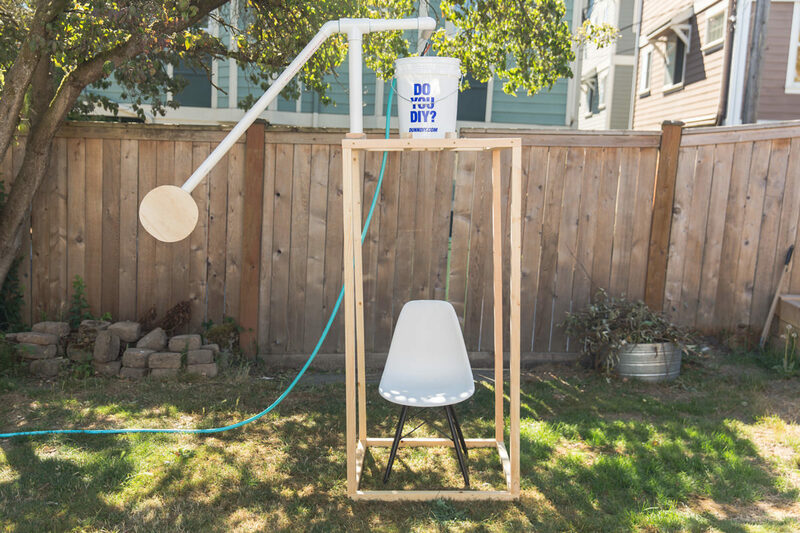 This homemade dunk tank is a little different than the dunking booth you may be envisioning—instead of the kind where you sit on a platform that plunges you into the water when the target is hit, you sit on a chair beneath a bucket that dumps water on you when the target is hit. The easiest way to explain how this works, especially because we’re using plumbing materials today, is that it works like a toilet. When you hit the target, it’s like flushing—the arm of the dunk tank pulls up the string that’s attached to the flapper at the bottom of the bucket, which then opens and dumps water through the hole at the bottom. 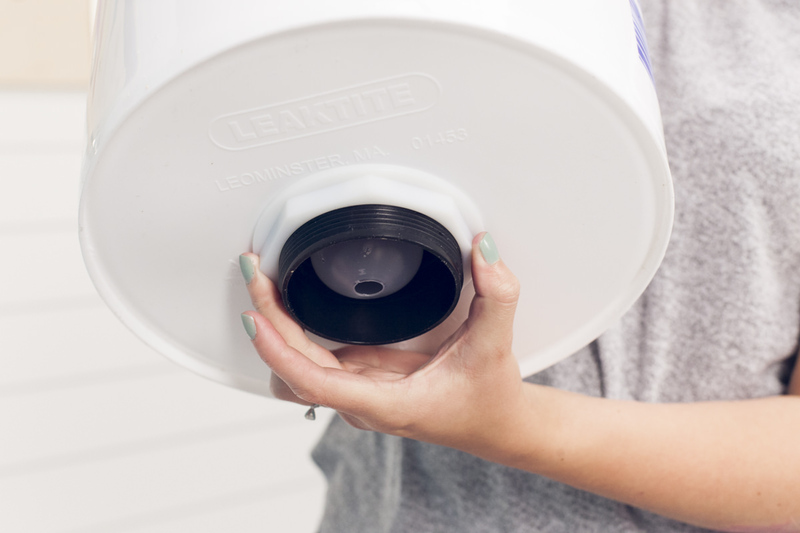 As soon as that happens, the bucket automatically fills up with just the right amount of water thanks to the float valve—just like a toilet! It’s helpful to have that context before we get started. One more note: It’s extra important not to deviate from the steps on this one—one missed design detail can quickly lead to chaos! We’ll need the bucket later, so we’re starting with using the bucket as the template for our target. 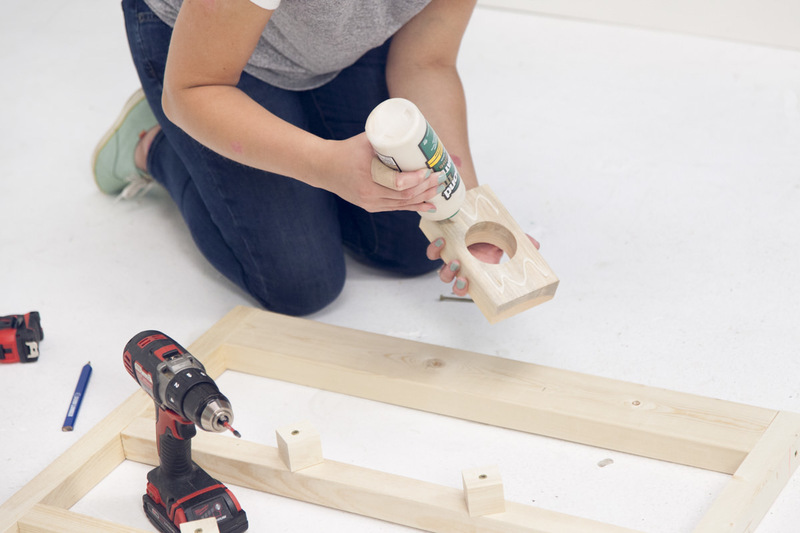 We used a 1/2" plywood sheet, but you can use whatever you have lying around—it just has to be 1/2" or thicker. There’s nothing precious about the size of the circle, either, so don’t worry if yours is a little bigger or smaller than ours. And if you don't have a jigsaw, you can always use a square of wood instead of a circle. 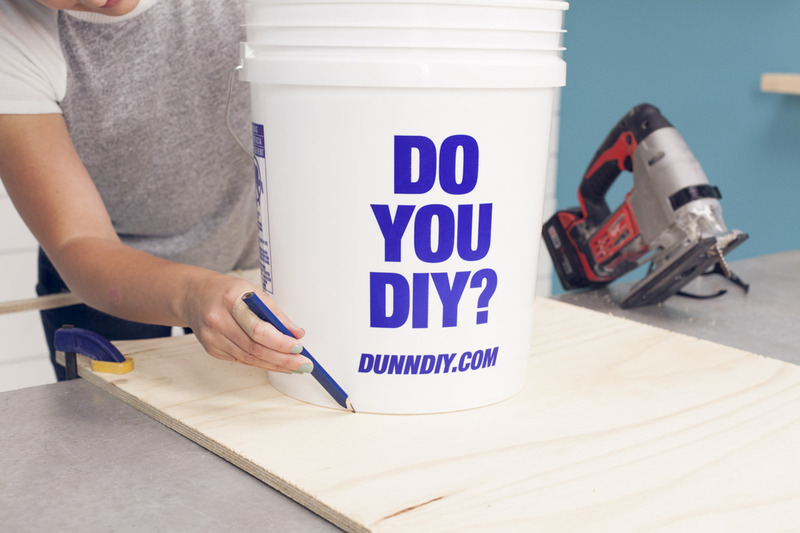 Clamp down your plywood, trace around the bottom side of the bucket to make a circle, then cut it out with a jigsaw. You can leave it plain, paint a target on it, have fun with a wood burner—whatever works. Then set it aside for now. Here comes the plumbing part. We bought a special flapper that’s larger than a standard one because we wanted more water to be dumped from the bucket at once. Ours is a 3” flapper. You can buy a flapper that includes only the flapper part, but if you do that, you won’t have anything to mount it to. We selected a flapper that’s attached to a mount to make things easier. That said, this particular flapper-mount combination has an overflow valve, which means once the water reaches a certain point, the flapper automatically opens, and we want a heck of a lot more water in the bucket before it opens. To solve this, plug the valve with a 3/4" PVC cap, then secure it and waterproof it with a silicone sealant. Now that the flapper’s ready to go, it’s time to drill a hole in the bucket for the flapper to fit into. Use a 3 1/4" hole saw to do this. 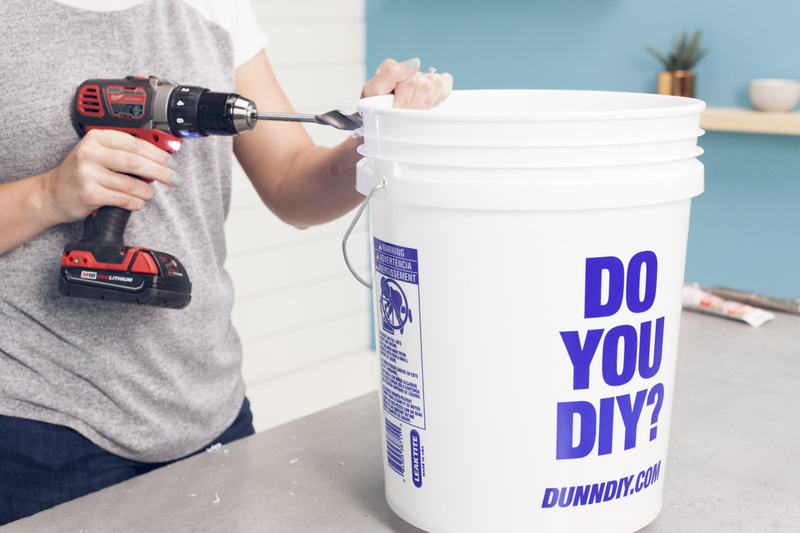 A word of advice: because the bucket is lightweight and the hole saw is large, the bucket tends to spin out of control all over the place. Be aware of that, and try to keep it grounded by placing your feet on either side. 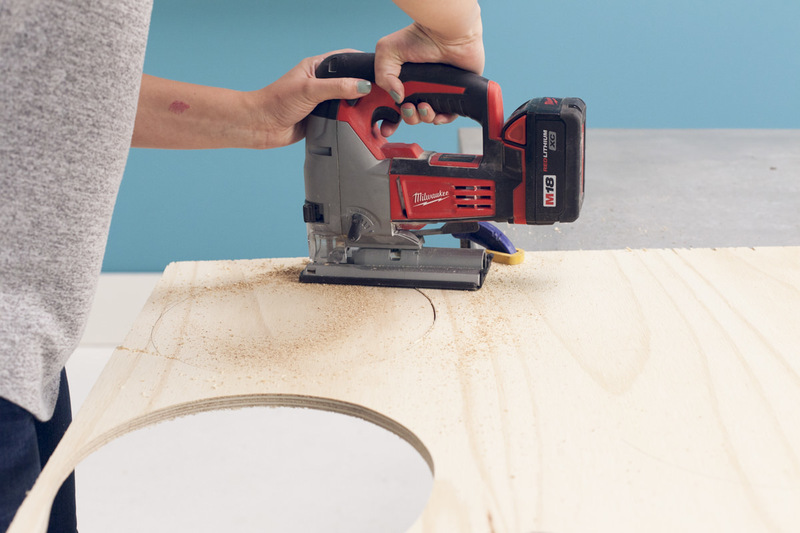 A general rule for working with a hole saw is high speed and light pressure—it works best for avoiding kickback from the drill. Use the plastic washer that came with the kit to secure the flapper in place. 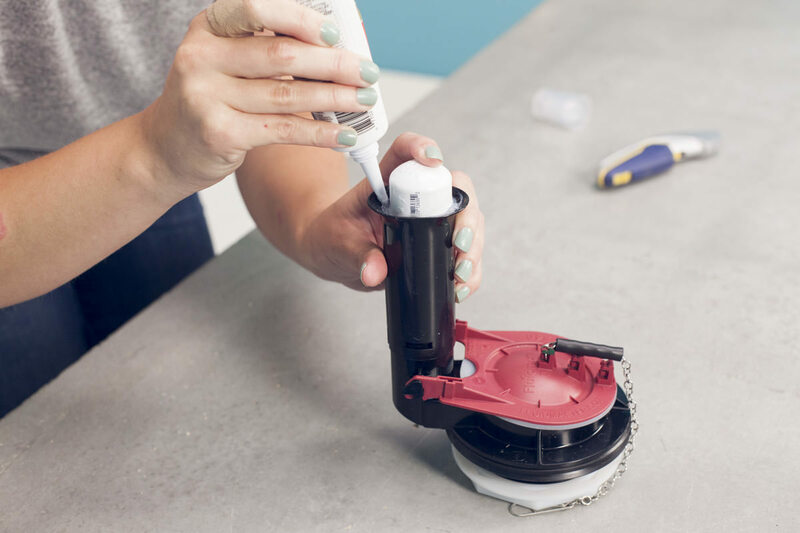 You can also use silicone sealant to prevent dripping, but we recommend waiting until everything is assembled to do this—because the flapper mount and the float valve can get in the way of each other and cause problems. Following this recommendation will allow you to adjust the flapper mount as needed. Note: the flapper kit came with a rubber gasket that attaches on the bottom of the mount (below the plastic washer). We didn't notice any difference with it on, so we didn't include it—but feel free to use it if you're having trouble with leaking! The float valve is what controls how much water goes into the bucket. It consists of a faucet, a ball float, and a rod that connects the faucet to the float. The hose is connected through an adapter to the faucet, which is how the water gets into the bucket. The ball float on the end of the rod rises with the water. Once it hits a certain point, the water from the hose automatically shuts off. Cool, right? The technology we’re using is old toilet technology. I looked at a lot of newer options through the process of building this dunk tank, and I couldn’t find anything that worked this well—everything else was much slower or sloppier, so trust me on this one! To install the float valve, drill a hole in the top rim of the bucket with a 3/4" bit (I found a Speedbor bit worked best, but you can also use a spade bit for this). Be sure to line up the hole with the overflow valve. 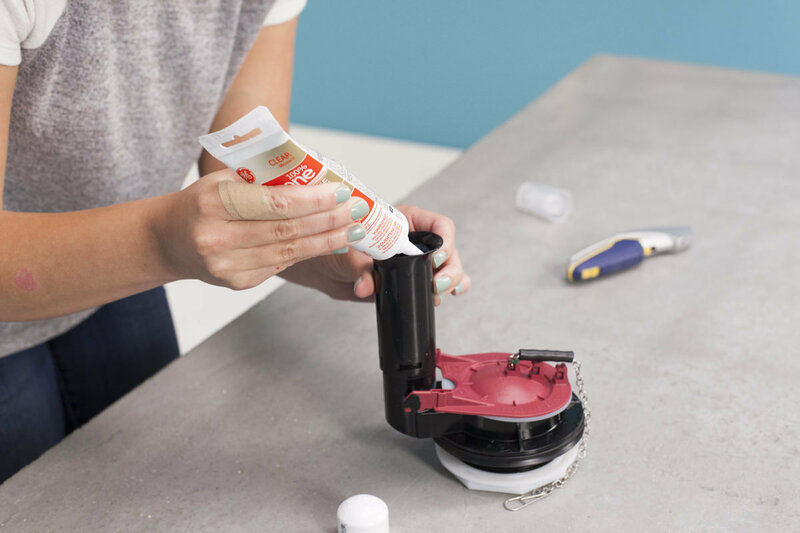 Cut the ridge away from the edge of the hole with a utility knife, then screw in the float valve, forming threads as you go. The ball floats we carry aren't threaded, but don’t worry—when you attach the rod to the ball, you’ll form those threads as you screw everything into place. When you attach the adapter to the faucet, be sure to get it really tight. This is where I experienced the most leaking, so I applied a sealant. OK! Now it’s time for the PVC pipe section of the dunk tank. 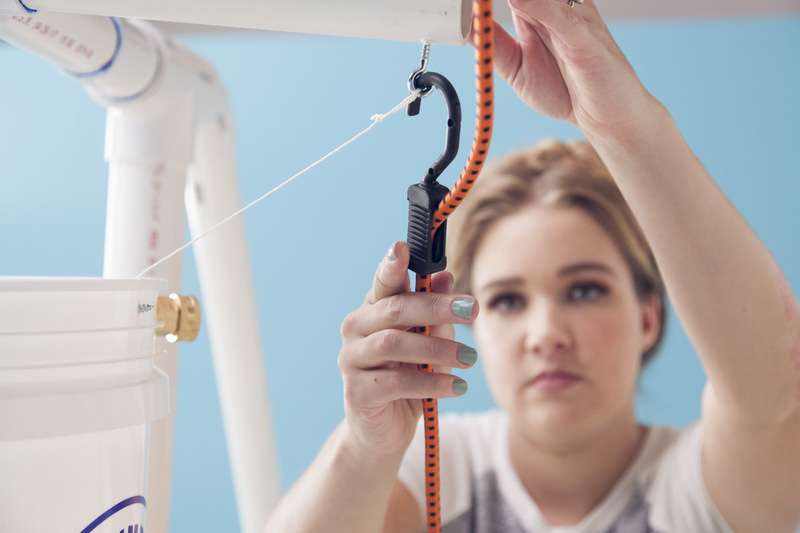 The PVC comes together to form the mechanism that connects the target to the string on the flapper (we’ll add the string later) so you can dunk someone. The target is essentially the toilet flush handle. When we’re finished with the next few steps, you’ll have a PVC post that comes out of the top of the dunk tank. 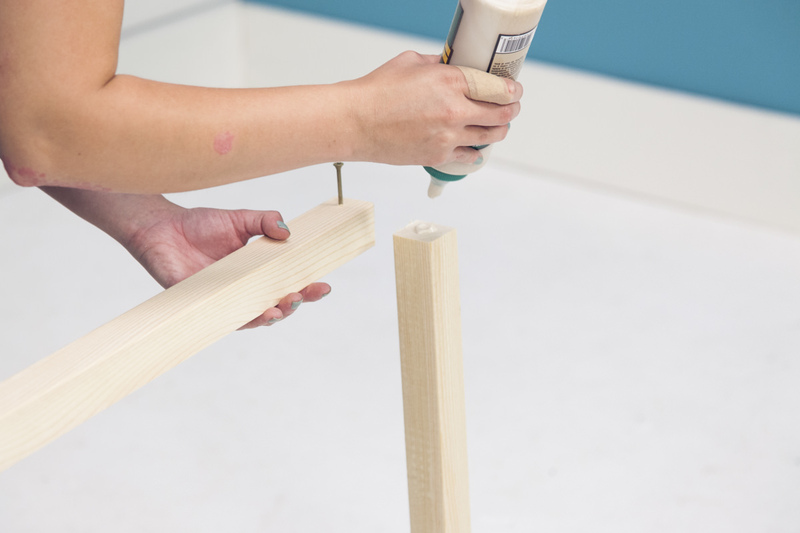 You'll find a PVC arm that angles downward on the left of the post—this is where the target is attached. On the right is an L—this is what pulls the string up to open the flapper. Both arms are able to pivot and move thanks to the axis, which is where we’re starting. Cut two 1 3/8" lengths of 2” PVC pipe and fit them inside the opposing ends of a 2” tee. Next, insert a 1 1/2" length of pipe with a 45° elbow into one end of the tee, and mark where the pipe comes out. Add the length of the inside lip of a 1 1/2" coupling. Now cut and attach the coupling to the end of the pipe so the 1 1/2" pipe moves freely inside of the tee but doesn’t slide out. 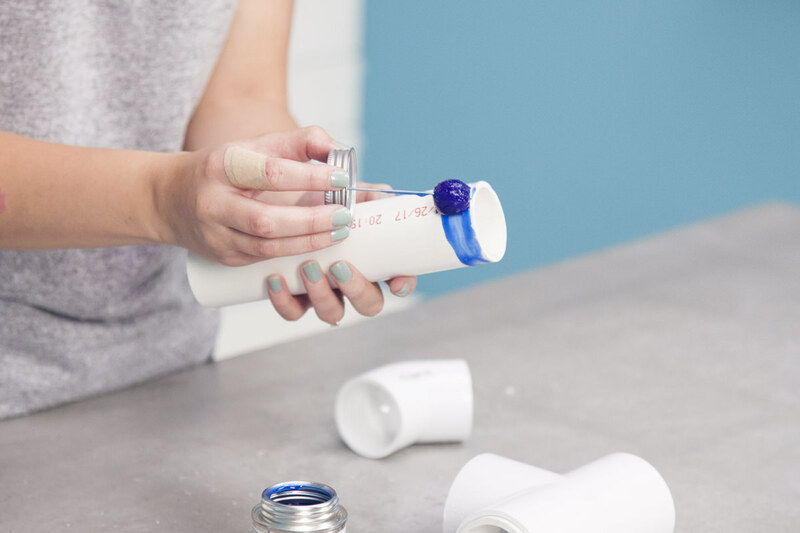 The point of a smaller pipe with a larger tee is movement—there’s just enough space for a little bit of give, which is what we need to make the target work. Next, glue. 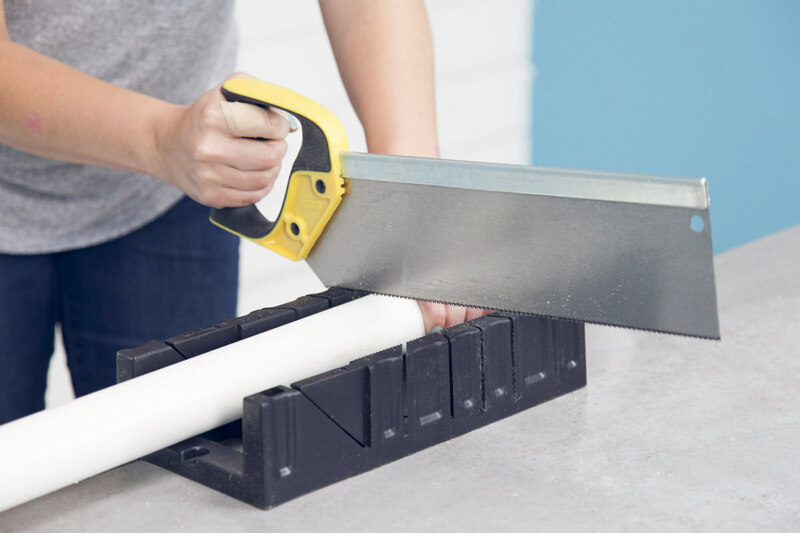 When gluing, make sure you’re working in a well-ventilated area (it has a strong smell), and that you’re using a PVC glue that doesn’t require primer (because who needs one more step?). Now that we have our axis, it’s time to create the “trigger”—this will move freely within the axis and will ensure the string is pulled and the water is dumped when you hit the target. We’re starting with the arm that will connect to the target—this will be on the left side of the dunk tank. 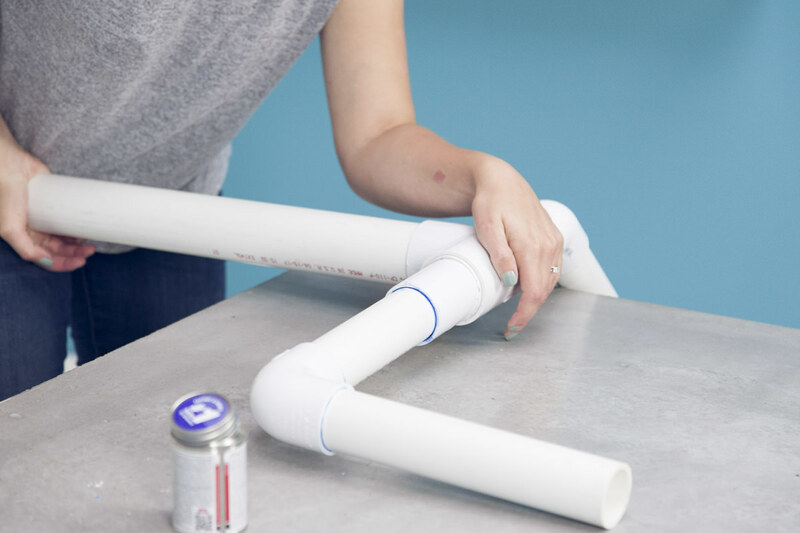 For the arm, use the 48” length of 1 1/2" pipe and insert it into the end of the 45° elbow on the axis. Create an L on the other side of the axis with the coupling. The L will lay flat (facing the rear of the dunk tank). When the target is hit, the L will turn upward, pull the string, and open the flapper. 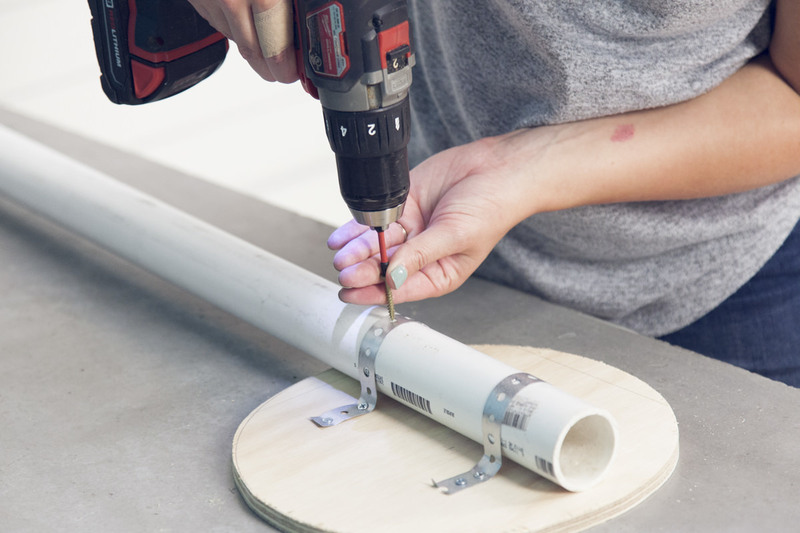 To create the L-shaped piece, cut a 8 1/2" piece from the 1 1/2" PVC pipe and attach to the coupling in the axis. 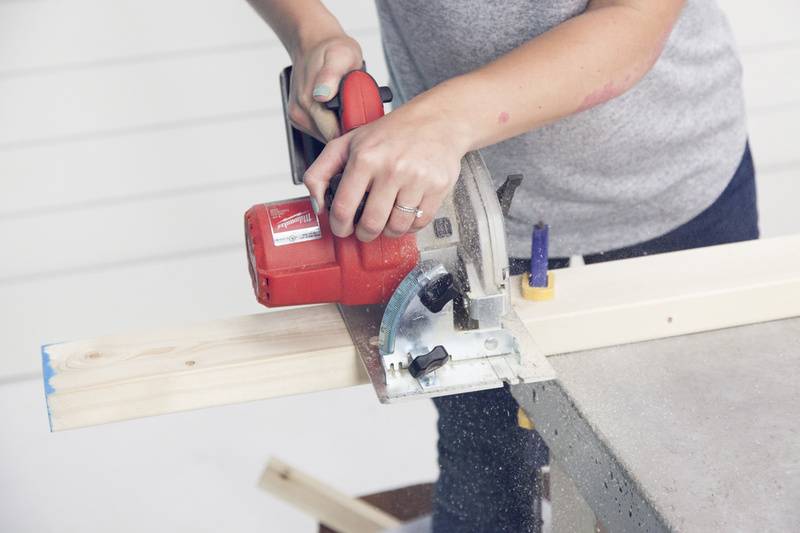 Attach a 90° elbow to the end, then cut a 10” piece of 1 1/2" pipe and attach it to the other end of the elbow. Finally, cut a 19 1/2" length of 2” PVC pipe and insert it into the bottom of the 2” tee. This is the post that holds everything at the right height. 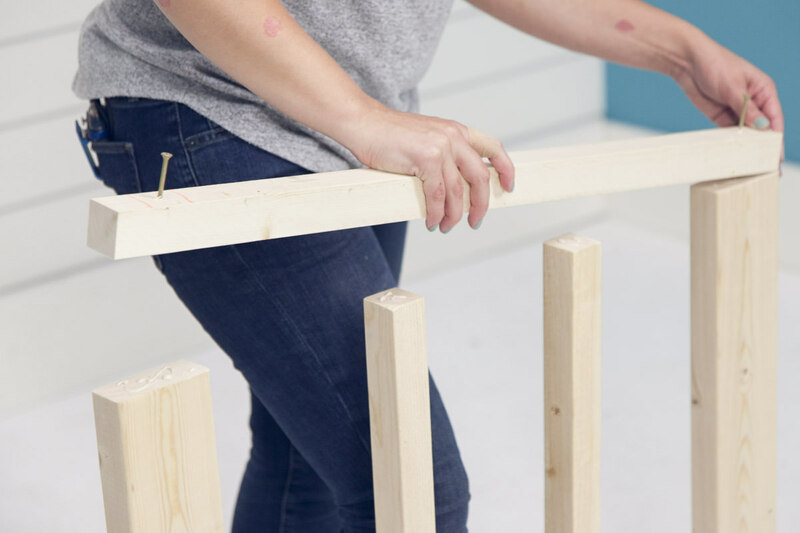 Glue everything into place—the diagonal target arm should point down, and the L-shaped arm should be parallel to the ground (and facing the rear). Make sure everything is secure, otherwise things will twist out of place whenever the target is hit. Phew! Now it’s time for my favorite part: cutting the lumber. I’m using two-by-two and two-by four framing lumber, which I already had lying around. Clamp wood and use a circular saw. Cut one two-by-four into two 27” pieces and one 6” piece. Cut your two-by-twos into four 30” pieces, four 27” pieces, and four 60” pieces. From the scraps, cut four small squares. 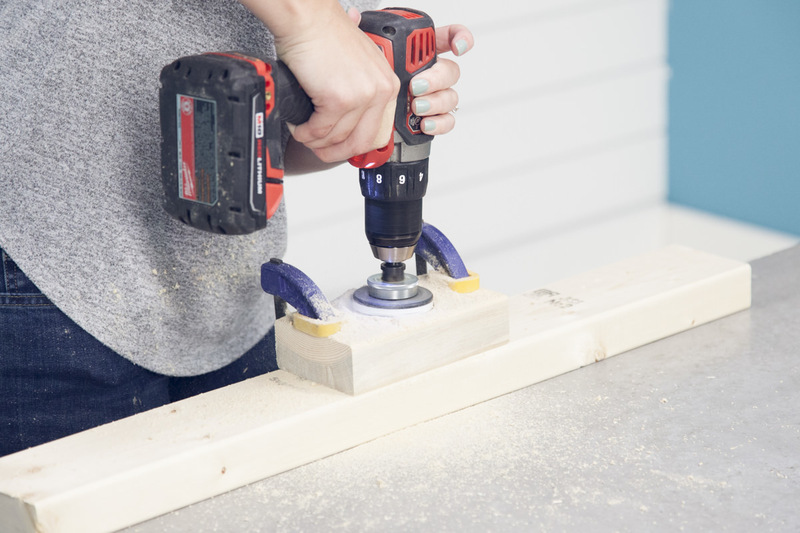 With a 2 3/8" hole saw, drill a hole through the middle of the 6” two-by-four piece. This will be the mount for the PVC mechanism—the post will sit in this hole. 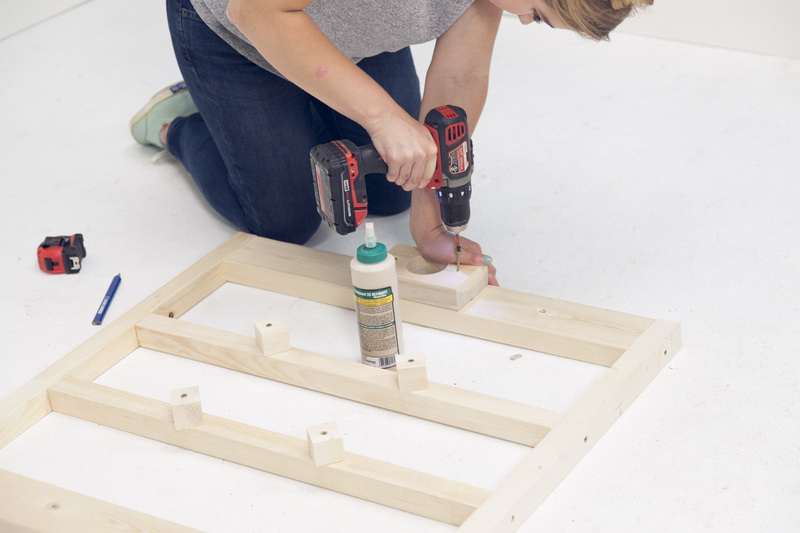 For the top part of the frame, form a square by attaching 23” two-by-two pieces in between your two 27” two-by-fours. Position the two 27” lengths of two-by-twos 9” apart in the middle of the square so they run parallel to the two-by-four sides. Use 3” screws and glue to attach everything. Center the bucket on the middle two-by-twos and position the small two-by-two scrap blocks to keep the bucket in place. 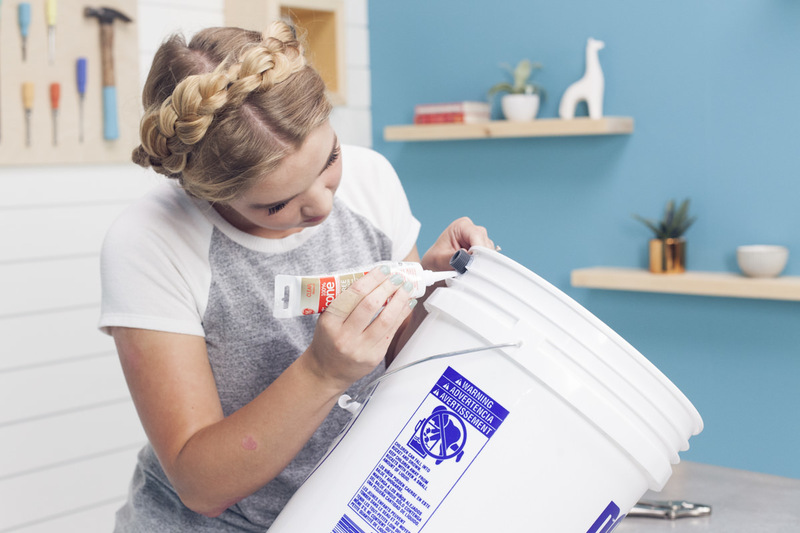 Don’t worry if the bucket isn’t perfectly centered—the blocks are there as a bumper so the bucket doesn’t slide out of place. Secure to the frame with screws and glue. 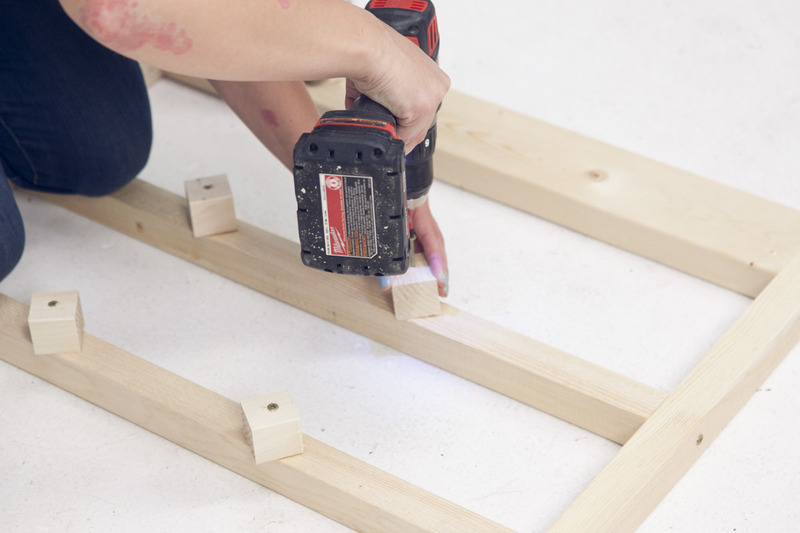 Next, take the 6” two-by-four you drilled a hole in and attach it to one of the two-by-four sides with glue and screws. For the bottom frame, form a square and attach two 27" two-by-twos to two 30" two-by-twos. Secure everything with 3" screws and glue. Next, connect the top and bottom parts of the frame together with 60” two-by-twos at each corner. 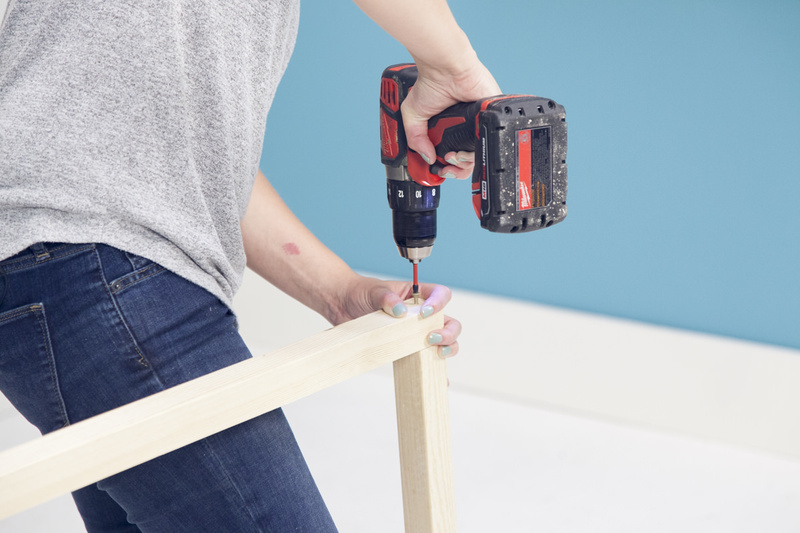 When drilling, make sure to avoid screws that are already in place. 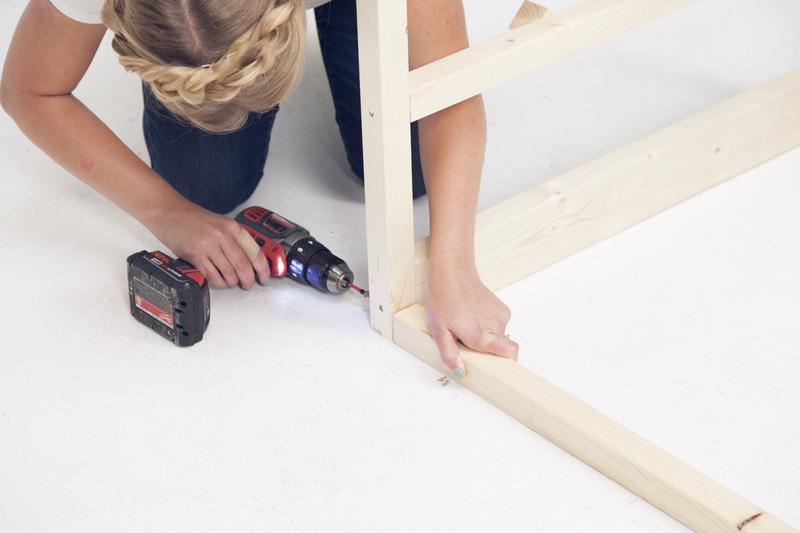 For this step, you can just use screws, or you can use screws and glue. 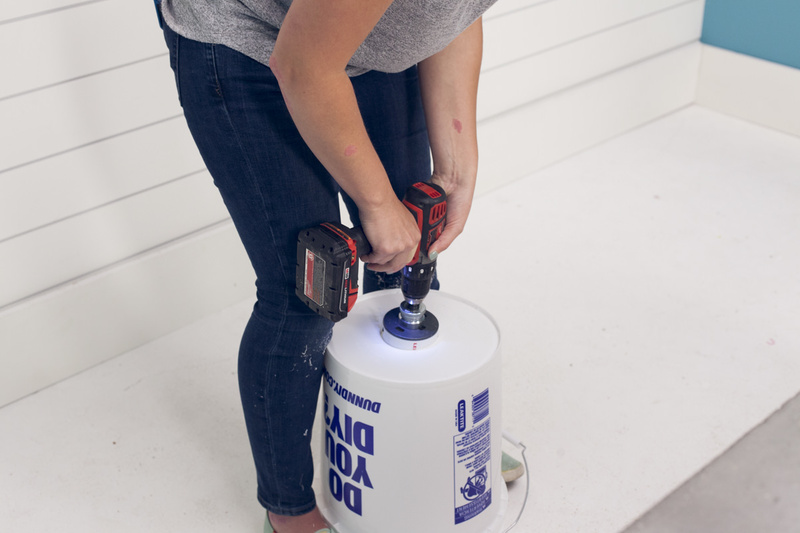 If you just use screws, you can disassemble the dunk tank and store it away during the cooler months. To make the dunk tank do its job, you have to rig it. 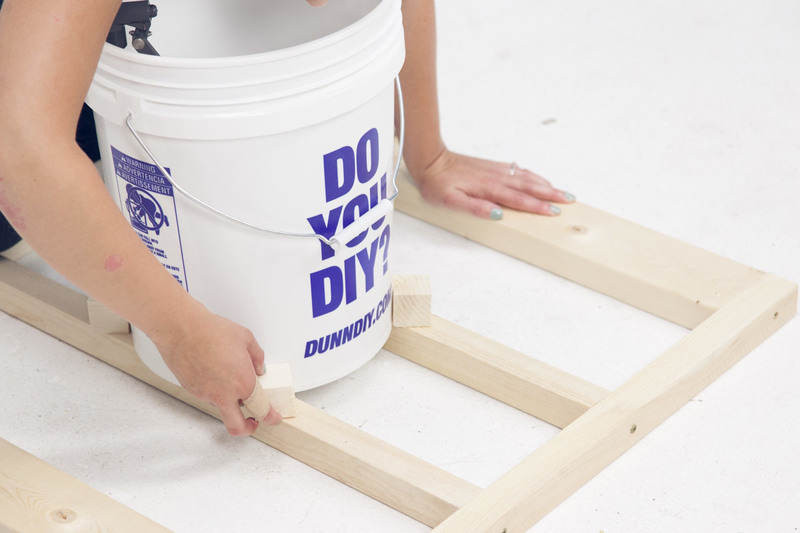 Place the bucket back on top of the plywood frame—it should rest inside the bumpers. 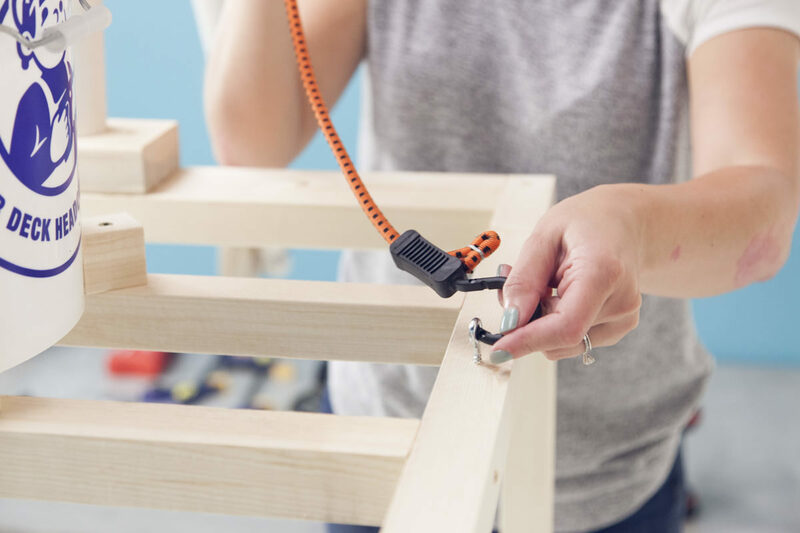 Slip the PVC post into the slot on the top of the frame and attach with 1 1/4" screws. 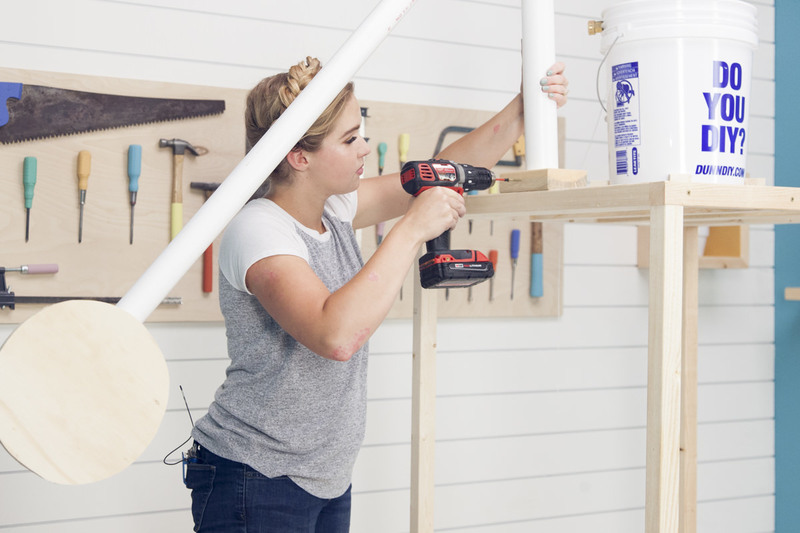 Attach screw eyes to the bottom of the PVC L (this is the piece that rests parallel to the ground, faces backwards, and is on the opposite side of the target), to the back side of the top of the bucket, and to the back of the frame. Next, tie a string to the flapper chain, thread it through the eye on the bucket, and tie it to the eye on the PVC L. Play around with the tension until it’s just right. 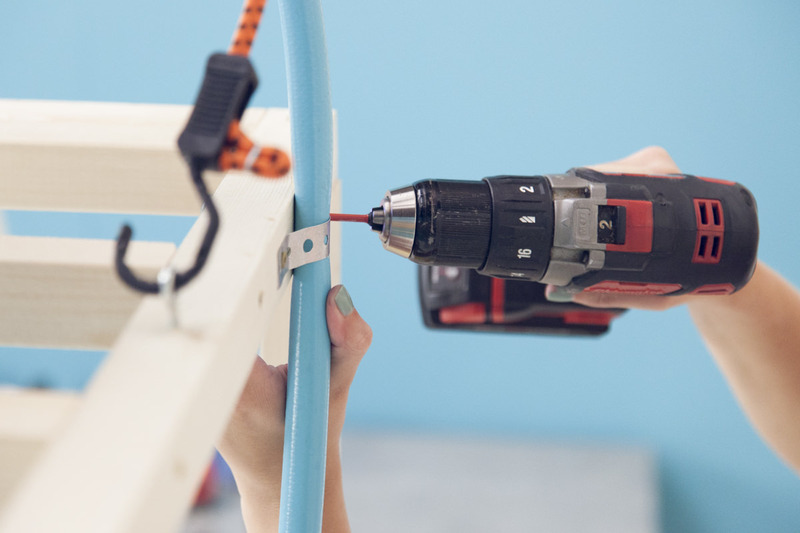 Attach an adjustable bungee cord between the eye on the frame and the eye on the L-shaped PVC pipe. Tighten it so the elastic prevents the arm from bending back too far and pulling out the flapper. Again, adjust as needed. 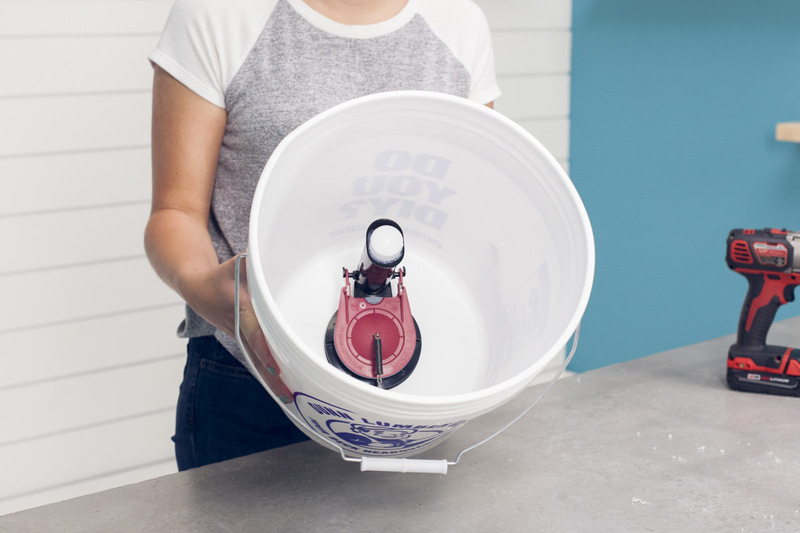 Then, adjust the height of the float valve—this will determine how much water can be in the bucket. 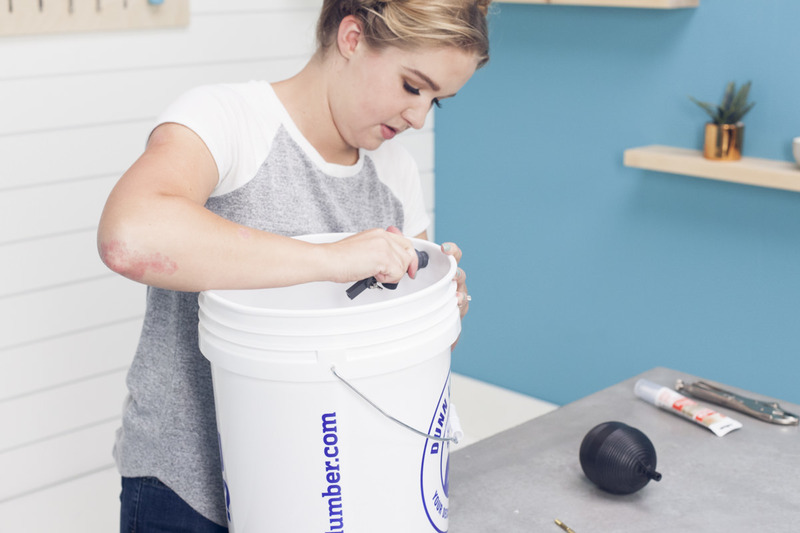 Make sure the ball float doesn’t run into the side of the bucket before it turns off the water—otherwise it’ll get stuck and the water will overflow. 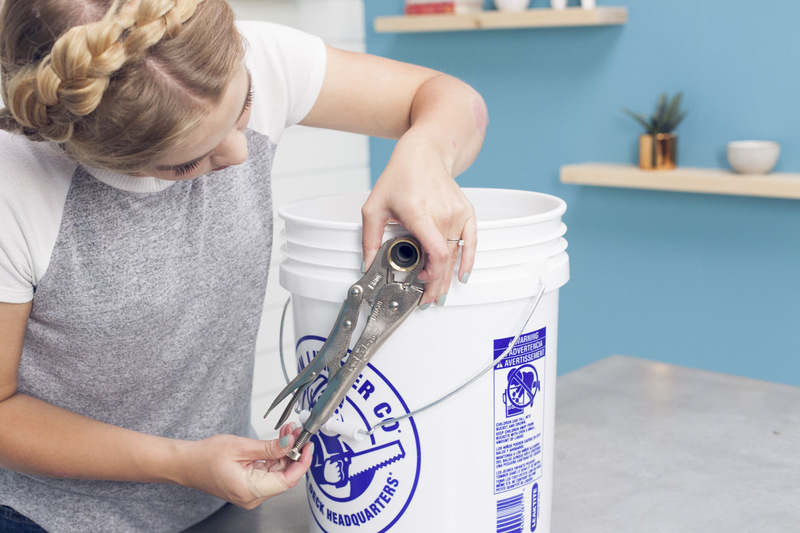 Finally, attach the hose to the adapter and support with plumber’s tape so it's not pulling on your bucket. Ta-da! Now instead of renting a dunk tank, you have your own homemade dunk tank that's good for parties and those extra-hot afternoons. Take it outside, slip a chair under the bucket, turn on the water, and invite all of your friends (or arch nemeses) over for a day of water activities. 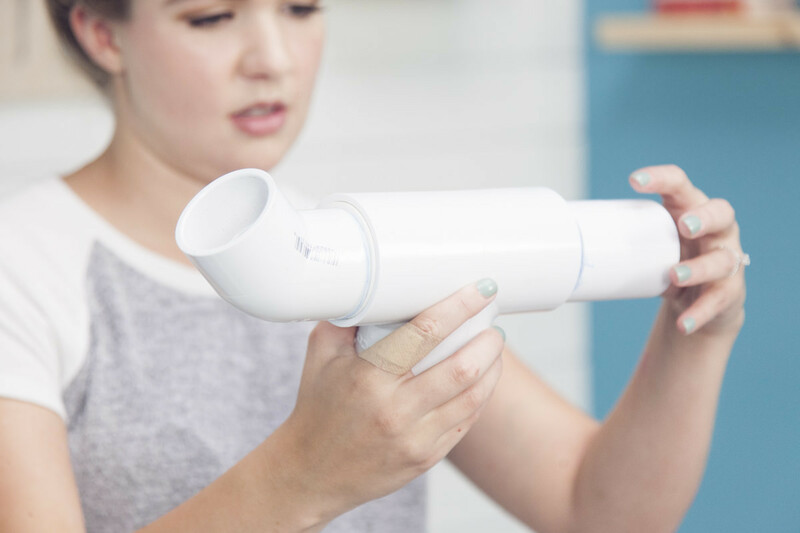 I learned so much during this project (I’m basically a plumber now and not-so-secretly want my toilet to break just so I can try to fix it) and had a lot of fun figuring things out along the way. Our family reunion is coming up—I’ll definitely be practicing my bean-bag throwing so I can dunk my dad on the first try. Start getting your garden in the mood for spring with this trellis, perfect for flowers, vines, or climbing plants like honeysuckle or jasmine. 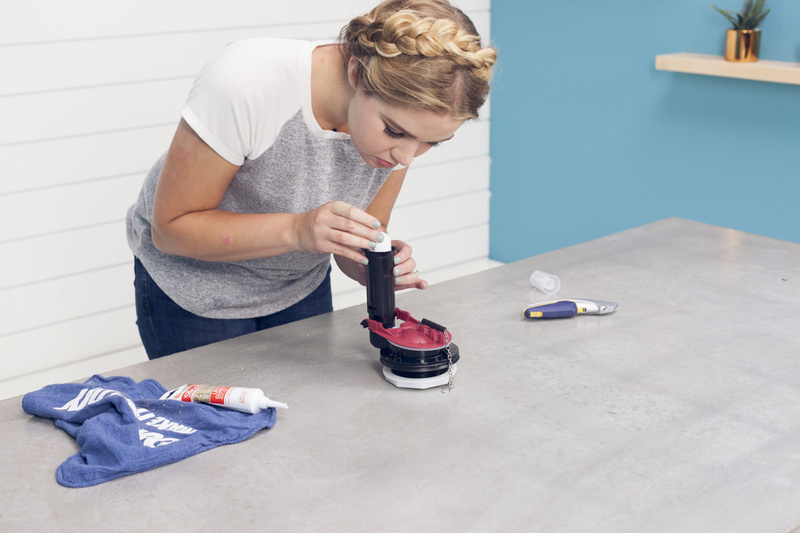 What can't you do with a little sandpaper and spray paint? On today's blog: a DIY chalkboard tray for summer entertaining.